“They outschemed us,” New York Knicks starting center Tyson Chandler said yesterday after a loss to the Brooklyn Nets at home, 103-80. Peculiar comments coming from the former Defensive Player of the Year and one-time All-Star, but there was more. When asked if the Nets ‘outscheming’ the Knicks had anything to do with Brooklyn’s head coach Jason Kidd playing with New York a season ago, Tyson answered affirmatively. “I’m sure it had a lot. Himself and Joe Johnson understanding, you know Joe played in Woody’s system and he understood how to exploit it, the same can be said with Jason.” One major part of history refutes the comments of Chandler. The previous time Brooklyn faced New York, Knicks fans had a blast at Barclays Center with a 113-83 blowout win. Knicks head coach Mike Woodson has not changed the scheme, and Jason Kidd was more recently a former Knick. Sorry Tyson, but a 53-point swing in about six weeks is more about effort, or lack there of. But Chandler wasn’t finished with his criticism of Mike Woodson. He was asked about the Knicks defensive strategy of switching pick and rolls on defense. 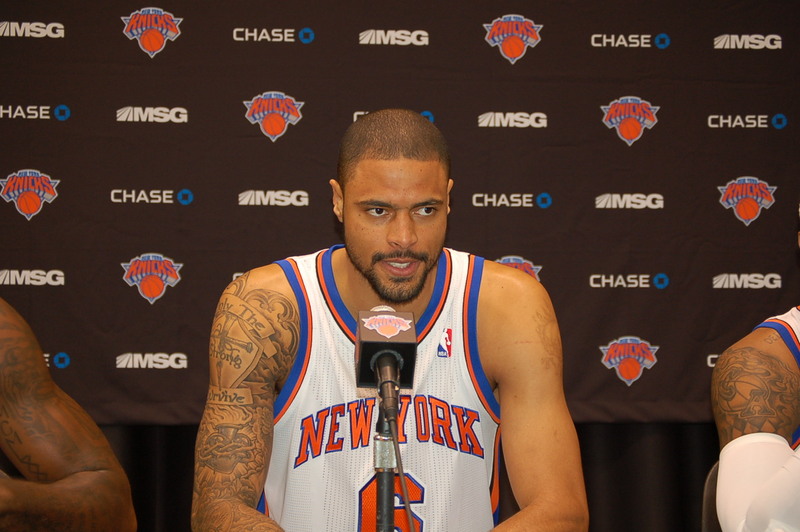 Why did an underperforming Tyson Chandler feel the need to express his opinions on this subject in such a manner? Frustration of losing certainly has to be a part of it, but at the same time, the Knicks used the same system that lead them to a 54-28 record and the second seed in the Eastern Conference a season ago. Tyson. unfortunately, is part of the problem. As the defensive anchor to this team, he has simply not been as effective on that end of the floor. Offensively, he is down in points, (10.4 to 7.9), rebounds, (10-7 to 8.0) shooting percentage, (64% to 56%) and minutes per game, (32.8 to 27.8), from last season. Why would a 13-year NBA veteran who is a liability on the offensive end of the court critique his coach so harshly? Without Chandler saying it, he clearly feels the team needs a new head coach. Unfortunately for Tyson, his underperformance means that he isn’t the voice that will force such a decision with Knicks ownership. If Carmelo Anthony had made the same comments, Mike Woodson may have been fired immediately. Perhaps Woodson should critique Chandler in the media, but that would be childish and unfitting of an NBA coach. Chandler’s comments, unfortunately, are unfitting of a supposed leader of the team, and points out that he may be part of the problem, as opposed to part of the solution.